Part two of these articles, imaginatively titled ‘HPV VAccine Gardasil 2‘ is here‘. Gardasil is a cervical cancer vaccine made by a firm called Merck. They are pushing the vaccine to be injected into all the girls between 12 and 13. 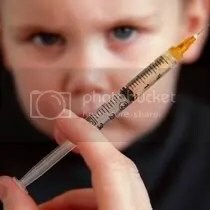 And now they want to inject boys with it. Why? Boys should be vaccinated against the sexually-transmitted disease which causes cervical cancer, a leading specialist said yesterday. While it is only a minor complaint in boys, the human papilloma virus can be passed on to unvaccinated partners. Ministers have already announced that girls aged 12 will be given the jab against it in the hope of saving around 700 lives a year. Now Dr Anne Szarewski of Cancer Research UK says 12 and 13-year-old boys should also receive the jab on the Health Service. Apart from passing on the disease in future years, she says maximising the number of recipients would increase immunity across the population. The vaccination has to be given to pre-teens because it is more effective before puberty. Dr Szarewski told GP magazine that just vaccinating girls sends out ‘a bad public health message.